In the animal kingdom, especially among those that are social, you’ll see a number of strategies employed to help the group’s chances of surviving. To each his own. For instance most ant colonies employ a social hierarchy where most members, like the worker ants, are rendered functionally sterile and only the absolute top of the ladder is allowed to reproduce (the queen). A particular ant species stands out in this respect because of the uncanny behavior of some of its worker ants, who are able to morph into queens – that is to obtain reproductive capabilities – by suffering dramatic physical changes. All, however, without any chances succumbing to the DNA code. Now, researchers at North Carolina State University, Arizona State University and the U.S. Department of Agriculture have found out why and how this happens: more dopamine. Here’s where the interesting stuff happens, though. The worker ants who have proven themselves to be part of the elite undergo dramatic physical changes: their brains shrink by 25 percent; their ovaries expand to fill their abdomens; and their life expectancy jumps from about six months to several years or more. These changes occur after certain genes are either switched on or off, which in turn are influenced by environmental factors, thus epigenetics. The researchers took a subset of workers from a colony (Colony A) and separated them from their gamergates. These workers effectively formed their own colony (Colony B) and began fighting to establish dominance, as expected. Those workers who began to distinguish themselves as future gamergates of Colony B were removed at their own turn from the colony. Subsequent analysis reveled that these dominant ants produced more dopamine than regular worker ants, yet still lower than full fledged gamergates. 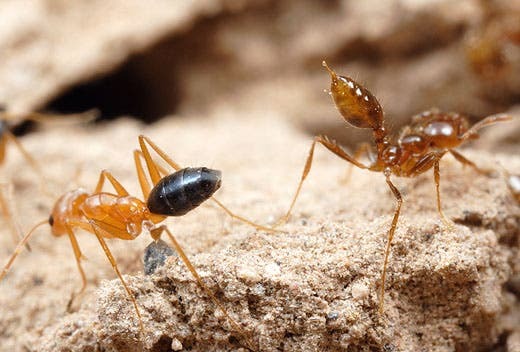 Finally, the researchers introduced these dominant worker ants back to colony A where the workers there recognized the changes in the dominant workers and exhibited “policing” behavior, holding down the dominant ants so that they couldn’t move. Within 24 hours, the dopamine levels in the dominant workers had dropped back to normal; they were just regular worker ants again. This proved that dopamine was the key factor that elicited this kind of behavior and triggered the massive physiological changes witnessed by the researchers. The findings, reported in a paper published in The Journal of Experimental Biology, could help shed light on other similar social behaviors reported in other insects. “Policing behavior occurs in wasps and other ant species, and this study shows just how that behavior can regulate hormone levels to affect physiology and ensure that workers don’t reproduce,” he explains.